Oak + Char is a 9,500 square foot upscale neighborhood Tavern and Grill featuring wines aged in oak barrels, whiskeys cured in charred oak and a menu riffing on Chicago; locally sourced ingredients in classic regional dishes inflected with the myriad immigrant cultures of the city. The design of this 5,200 square foot, 160 seat restaurant is inspired by the menu and the emergence of the city from the great Chicago Fire of 1871. The budget for construction, fixtures furniture and equipment was $427,000.00. The plan sets four open but intimate ‘rooms’ within an open room in a repurposed heavy timber and masonry industrial loft. 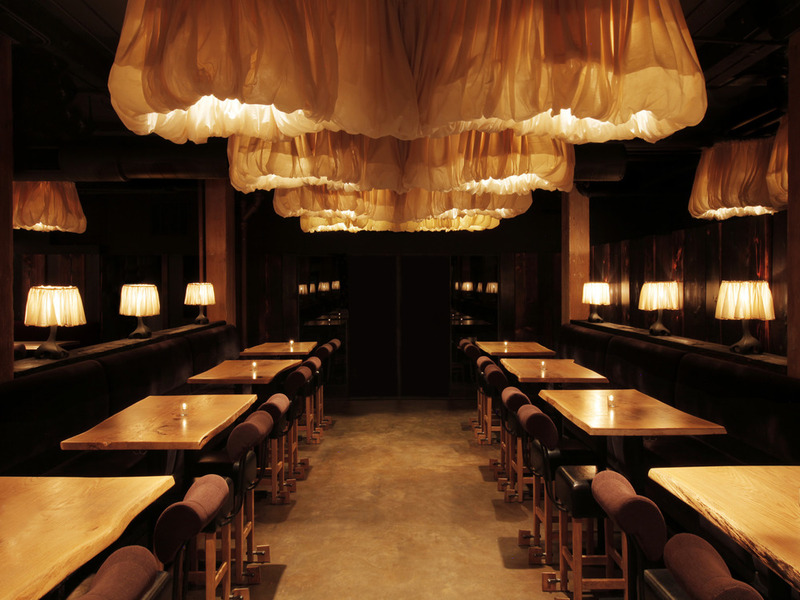 The bar and large dining room feature high tavern seating. All design elements are custom; hand-made by Chicagoans working with locally sourced and often reclaimed solid materials designed to improve with patinas over time: millwork composed of white oak slabs from a tree felled by lightning, or hot rolled steel with cast hinges and oak legs; partitions of 3 1/2” thick carved, charred and oiled Douglas fir; custom ‘Stockyard’ stools of leather, cast-steel and solid oak ‘spurs’; cubist oak-leaf door pulls, table lamps inspired by lone oak trees carved from oak, cast in 94% recycled and “murdered out” with acid; linen sound-absorbing “cloud” pendants to attenuate sound; murals of abstracted acorns, oak bark and leaves; a bar of reclaimed 60 year-old African Ironwood and common brick wall colors amplified with pigment; wool felt partitions. A Chicago Tavern and Grill. Chicago burned in 1871 and from the charred remains emerged one of the first modern cities, a city described by Mayor Daley as a mosaic of ethnic neighborhoods. Chicago is interpreted here with Midwestern inflected by a myriad of cultures. The food is cooked over open fire, in clay pots, in tandoor ovens with burning wood inside. Dishes are flavored with the smoke of pear wood and maple wood. Oak + Char features wines and whiskeys aged in oak and charred oak barrels. A Chicago tavern and grill in a repurposed heavy timber industrial loft composed of Douglas fir and Chicago common brick and steel in the shadow of the mass transit train elevated on riveted steel. A Chicago design recalling the Chicago fire and celebrating the oak used to age the wine and spirits and cook and season farmer’s meats and produce. Recycled barstools: created from recycled backless barstools: sand blasted wood and re-stained leather, with new backs composed of hand bent hot rolled steel channel and oak framed winged back rests upholstered in brown wool limousine fabric with cast aluminum and solid oak “spurs” to stabilize them. High banquettes of brown wool mohair and welded structural steel bases suggestive of the 100 year old elevated train structure outside.